Presenting Doctor Who: Engines of War by George Mann. "I've had many faces. Many lives. I don't admit to all of them. There's one life I've tried very hard to forget-the Doctor who fought in the Time War." On the outer rim of the Tantalus Eye, scores of human colony planets are now overrun by Dalek occupation forces. A weary, angry Doctor leads a flotilla of Battle TARDISes against the Dalek stronghold but in the midst of the carnage, the Doctor's TARDIS crashes to a planet below: Moldox. Searching for answers, the Doctor meets 'Cinder', a young Dalek hunter. Their struggles to discover the Dalek plan take them from the ruins of Moldox to the halls of Gallifrey and set in chain events that will change everything. And everyone. Seen for the first time in the episode 'The Name of the Doctor' and at length in the 50th Anniversary episode 'The Day of the Doctor', 'Engines of War' features the war weary Warrior Doctor played by John Hurts. 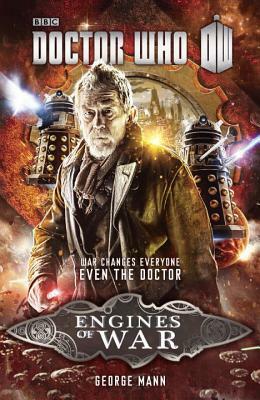 In terms of firsts, 'Engines of War' also marks the first literary appearance of the War Doctor and George Mann with the material available created a power packed adventure during the Last Great Time War, very much like watching an actual episode happening instead of reading about it. With the limited screentime given to the War Doctor, it is rather difficult to gauge how different this incarnation is from the rest of them. From the much we have seen and what Matt Smith's Doctor said in the episode 'The Name of the Doctor', that he committed a lot of acts that the Doctor would never do and had lost the write to call himself such. But Mann did a wonderful job and in my limited experience with Doctor Who literature, this being the third of its number. I'd say Mann did a marvelous job translating a story from a television show for the books. Allusions to the various elements in the rich Doctor Who history. Lots and lots of action, drama and thrill. Time Lords and the Daleks, mutations included. Scientific gobbledygook. And of course lots and lots of running. And the author did a great job of it all. And if I am hinging on an inference. I'd say that the events of the book lead John Hurts' War Doctor to reach his limits and resign himself to finally use 'The Moment' and proclaim with his gruff voice 'NO MORE'. "First and quite an exciting literary adventure for the War Doctor"